Ever wonder what it’s like to plummet toward the earth at speeds that would liquefy you on impact? To hiss through the air, scratching the tops of evergreens and the hard-stone faces of rough mountain crags? For most of us, that desire is tempered by the fact no one wants to be scraped off a rock with a spatula at the end of this face-first joyride. Fortunately, Gajin Entertainment aims to provide a safer, virtual alternative to the expensive equipment and looming threat of death in the event said equipment fails. Skydive: Proximity Flight, a base jumping title headed to Xbox Live Arcade this fall, will strap you into a wing suit and gently nudge you off a cliff, letting the wondrous clash of air resistance and terminal velocity guide you to a statistically-probable impact amidst the majesty of nature. The Moscow-based developer plans to include a race mode, allowing you to compete against rival jumpers (divers? wingsuiters?) to see who can fall the fastest and perform a suite of complex mid-air tricks. In addition, players will be able to undertake increasingly difficult routes in a separate mode, following a series of checkpoints to the finish, because when you’re already hurtling toward the ground you might as well try to do it through a gold ring or two. For the less rigid, Skydive: Proximity Flight offers a Freestyle Mode, in which you can choose any location from which to fling yourself, and fall however you like (as long as it’s down), creating your own routes and incorporating tricks. You can then share these runs, and challenge other players in the community to mimic your fall – like a nightmare version of H-O-R-S-E, except when you miss a basket, you die horribly. 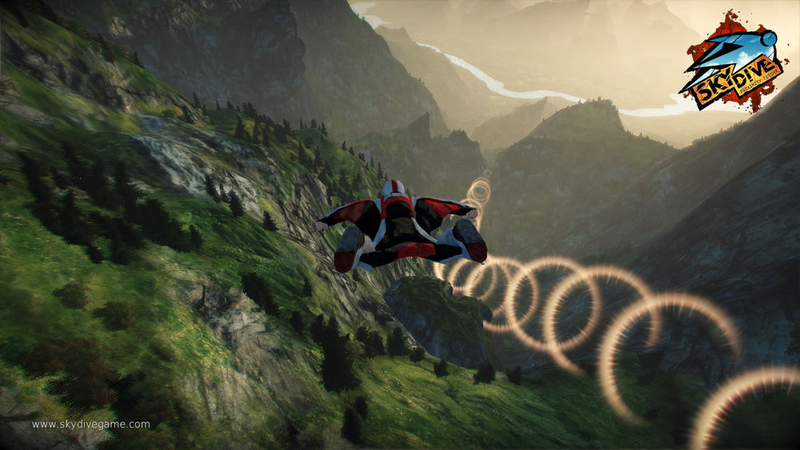 All joking aside, Skydive: Proximity Flight is looking pretty cool and will function with both a controller and Kinect. And before you groan at the thought of standing in front of your console, arms outstretched whispering, “Wooossshhhh” while you lean from side to side, the Kinect support is completely optional. You’ll find the official trailer after the jump, it’s definitely worth a watch.